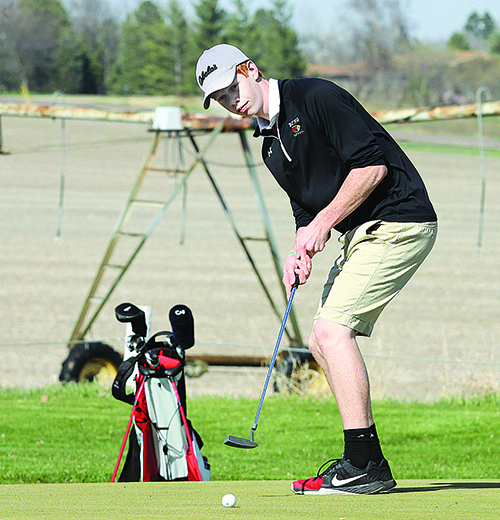 The Boone Central/Newman Grove boys golf team teed off its 2017 spring season this past week with tournament and dual play. The Cardinals competed in the Ord Invitational Tuesday, April 4, placing 6th in the 12-team field. Spalding Academy also participated, placing 7th in the team standings. Grand Island Central Catholic was the team champion with an 18-hole total of 321. Boone Central/Newman Grove finished at 410. The Cardinals did not have any individual medalists in the meet, but Bryton Fowlkes was close to the top 15, finishing 21st with a round of 94. Fowlkes followed a 51 on his first nine with a strong 43 on his second circuit. Nathan Gottier carded a 97 for Boone Central/Newman Grove and Garrett Cornwell shot a 99. Tournament top medalist was Josh Cuddy of O’Neill (73) who finished five strokes in front of GICC’s Jack Goering (78). Bryton Fowlkes (51/43-94), Nathan Gottier (50/47-97), Garrett Cornwell (53/46-99), Mack Nelson (57/63-120), Bradon Anderson (64/58-122). Boone Central/Newman Grove followed up its initial tournament action of the season with dual competition vs. Ord Friday at the Albion Country Club. The visiting Chants defeated BC/NG 181-204 over nine holes played in fierce winds. Or’d Cy Trofholz had the day’s low round with a 43 and teammate Caden Johnson carded a 44. Fowlkes and Cornwell led the Cardinals with rounds of 47. Ord: Cy Trofholz 43, Caden Johnson 44, Tanner Bundy 46, Brooks Bechtold 48, Riley Massman 56.